My 3D foam board plane has a single aileron servo mounted on the center line, with control rods going out to the aileron horns at an angle. It’s a common setup, but one I can’t get to work right as the ailerons are pulled up more than they are pushed down. 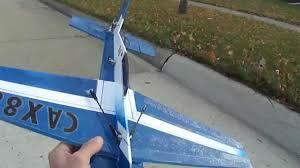 I get about 30 degrees up aileron, and about 20 degrees down. And yes, I start with the servo centered and aileron level. I’m assuming that this is due to the angle of the control rod. And that the greater the angle, the greater the inequality. But, since I can’t reduce the angle, what can I do? Attached is a photo of a similar plane. Short answer, leave it alone. It sounds like you have accidentally built in aileron differential. A downward deflected aileron causes more drag than an upward deflected one, yawing the plane in the opposite direction you want to go. Sometimes we add "differential" to the ailerons to deflect them up more than down to reduce this adverse yaw tendency. Differential becomes more necessary when you have large ailerons and no rudder. Mind you more up than down is a good feature and called differential. It can make rolls truly axial but if it bothers you you can change the deflection rates by shifting the control horn forward or aft on the aileron. 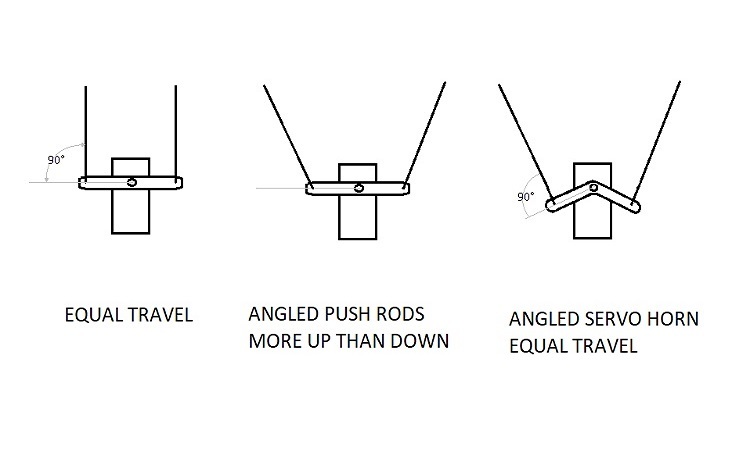 Normally the control horns are located such that the pushrod connects to the control horn directly above the hinge line but shifting the control horn connection point forward of or rearwards of the hinge line can effect the linearity of the pushrod input Vs control surface movement. Experiment using tape or similar before making any permanent changes of course. May sound dumb, but are your holes in the control horn directly over the hinge line? To obtain equal travel a push rod has to be at 90 degrees to the servo arm. Yours are not so there will be a some differential action. In your case it is giving more aileron up than down which is quite acceptable. The 'best' solution with your layout would be to use an angled servo arm to restore the 90 degree angle to the push rod. Ha! Finally something that seems like a mistake turns out to be a positive. How often does that happen? On a "normal" plane differential would be considered a good thing. But is it desirable on a 3D plane? It does indeed help. Shouldn't be too hard to make the angled servo arm. Although the previous posts may have convinced me that I should be happy with my accidental achievement of differential. Glad I also discovered this forum, Flite Test, and the world of cheap easy to experiment with foam board planes. The rules or aerodynamics still apply even it the only airflow is due to propeller thrust. Mind you the lack of a lifting requirement in the hover does markedly reduce any differential requirement. I have a mini saturn with the same setup as you describe and it flies and hovers quite well without it tending to "Walk" or drift in the hover, (in still air that is! My Reaktor and MXS have 2 separate servos for their ailerons so their performance is not relevant to your question or issue! Actually making a dual angled servo arm will be hard because of the required splines on the hub. However, the good news is that many servos come with a disc shaped servo "arm", if you can call a disc an arm. Simply drill holes for the wire in the appropriate spot so that the push rod wires are at 90 degrees, similar to the previous drawing of an angled servo arm, and you're good to go.